Quincy Restaurant: No Thanks, Jack Harris! N. 40th St. in east Tampa by the Hillsborough River and down the road from Big John's Alabama BBQ. 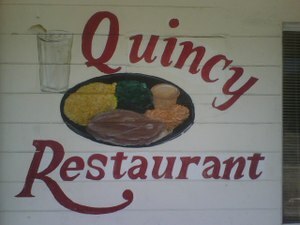 When we showed up at Quincy around mid-day the small, humble-looking restaurant was empty save for one other couple. That didn't discourage us, though, as this was the same place Tampa Bay On Demand's Jack Harris had raved about and had said that Tampa mayor Pam Iorio was a regular guest. Sure enough pictures of Mayor Pam were up on the wall by the counter. After looking over the hand-written wall menu I ordered fried catfish with black eyed peas and tomatoes-and-okra, while Traci ordered baked chicken with fries and tomatoes-and-okra as well. While northerners turn up their nose at catfish, I grew up in the south and don't know any better. Each meal also came with cornbread. At this point, I was still optimistic we were in for a treat. Unfortunately, while the service was friendly and aimed to please, the food was just very average. Everything might have been made fresh originally, but was clearly just re-heated by the time we had it. Maybe things are different during the week. In any case, this wasn't the hidden gem that Jack Harris made the place out to be and we fell for. Shame on us I guess for taking the bait. While Quincy wasn't worth the drive for us, I still think Tampa Bay On Demand (on Channel 340 for Bright House Networks customers) is worth checking out for local dining ideas and all sorts of other local content. Of course, just take Jack Harris' praise with a big grain of salt! Bottom-line: We might have just caught Quincy on an off-day, but this wasn't the tasty southern home-style cooking we were hoping for. We're still looking for that hidden gem. Inspection Scorecard: Last Inspection - February 2006 violations - Critical (3), Non-Critical (1).